THE BLEACHER BRIEFINGS: Will the Old MVP Be M.I.A. This Year in Mil-town? Will the Old MVP Be M.I.A. This Year in Mil-town? Anyone but me old enough to remember the old TV show "To Tell the Truth?" If so, you'll remember how they revealed the real person for whom they were looking. It's the same question we'll all be asking in a few weeks when the MLB season starts. "Will the real Ryan Braun please stand up?" 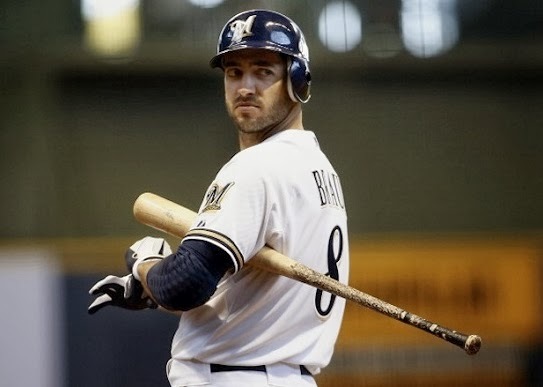 The Brewers hope, in fact they're banking on, the real Ryan Braun being the dominant player of 2011 and 2012. Even without the steroids he admitted using during last year's Biogenesis scandal. The question is, without performance enhancing drugs, can he even be a shadow of his former self? My guess is no, but I've been wrong before. Braun has only admitted to using one year (2011), but a quick glance at his career numbers indicate one of two things; either the steroids had virtually no effect on his performance the one year he claims to have used (2011 - this is the scenario the Brewers hope is true), or he was using his entire career (in my opinion, the more likely scenario). Is it me, or are all those seasons (with the exception of the suspension year) eerily similar? Who knows? Maybe he is just that good. One thing is certain; this will be a very telling season. With the scrutiny Braun will be under coming off the suspension, any drop-off from those consistent numbers he posted from 2007-2012 will be greatly magnified. If he only hits .280 with 23 homers and 80 runs batted in, slugs .450 with an OPS around .800, it will be very telling as to the extent of his juicing. Either way, the Brewers and Braun will be under the microscope all season long. And in a division that boasted three playoff teams last year, excess pressure could be all it takes for both to implode. Who needs game shows when you have this type of real-life intrigue? Not sure how this is biased, simply for not mentioning that. I said throughout how good his numbers have been from the day he broke in. I find it very hard to believe that he didn't use each and every year he was in the league. Prince is gone this year, as are the steroids. We'll see just how good he is. But whether it's biased or not is irrelevant. It's a sports column, based on opinion. It's supposed to reflect my opinion, i.e., my bias. Braun is an absolute scumbag. Hope he tears both his ACL's and has to retire. Can't stand the guy.